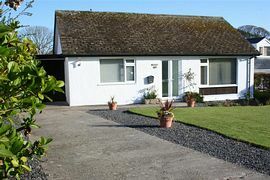 A modern bungalow in the popular seaside town of Benllech, Wavecrest is the ideal place for both families and couples. 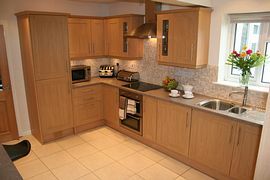 Decorated to a high standard throughout, Wavecrest can comfortably accommodate up to six people. Within easy walking distance are all the shops, bars and restaurants that Benllech has to offer and the beautiful blue flag awarded sandy beach that stretches round to Red Wharf Bay. There is a large front garden with sea views, a driveway with parking for 3 cars and a large enclosed private rear garden with patio furniture and a BBQ. The entrance hallway leads to the front twin bedroom, the rear double bedroom with a hand wash basin and also into a very modern bathroom with both a bath and a walk in shower. The living room with its sea view window has a comfy three seater, two seater and armchair leather suite, a flat screen television with BT Vison, a DVD player with an assortment of DVD's to enjoy and a stereo with an iPod docking station. The living room then leads into a very modern and spacious kitchen with all the essential equipment including a microwave, toaster, kettle, washing machine and breakfast bar. 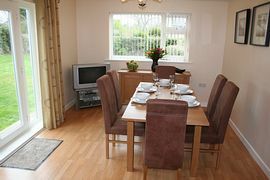 At the rear of the bungalow is the sun lounge /dining room with french doors opening out into the large rear garden and patio area, a dining room table that seats six people and another television again with Freeview. 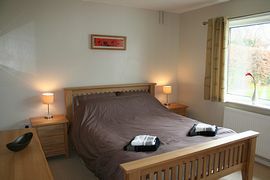 There is also a two seater sofa bed, and as the room can be closed off from the rest of the bungalow makes a great additional room in which to sleep. Free unlimited wireless internet is also available throughout the property. Wavecrest is in the heart of Benllech, with everything only a short stroll away. It is also in a great location on the east coast of Anglesey to explore all the beautiful beaches and countryside that the rest of Anglesey has to offer. With the mainland only 10 minutes drive away, it is also perfect for trips to Snowdonia National Park or even a day trip to Ireland from Holyhead. Whether it is water sports, golf, cycling, horse riding, bird watching or just peaceful coastal walks that you want, Wavecrest is perfect for everything. With a wide range of activities and cultural trips available locally from the Anglesey Sea Zoo to Beaumaris Castle, you can do as much or as little as you want while staying on this beautiful island. Blue flag awarded sandy beach only 10 minutes walk away. Use as a base to explore Snowdonia National Park. Large front and rear gardens and a driveway with parking for three cars. There ia a patio area with furniture and a BBQ and bikes and walking gear can be stored in the garage. Local Services: All shops, pubs, restaurants and takeaways are within a five minute walk. Leave the A55 at junction 8, then turn right onto the A5025 signposted Benllech. At the roundabout take the second exit onto the the A5025. Once in Benllech, after the Breeze Hill pub on the left hand side, turn left onto Breeze Hill. Wavecrest is the second on the right. Wavecrest is available all the year round, please visit our website for availability. Week bookings are Saturday to Saturday. Mid week and weekend bookings, are available during low and mid seasons. Please enquire for prices for short stay bookings. Arrival time 4pm, departure by 10am.